By Jim Dower: As expected, WBO super bantamweight champion Nonito Donaire (31-1, 20 KO’s) destroyed an undersized past his best 5’4″ Jorge Arce (61-7-2, 46 KO’s) in a 3rd round knockout on Saturday night at the Toyota Center in Houston, Texas. Donaire knocked the 33-year-old Arce down three times in the fight, once in the 1st and twice more in the 3rd to get the knockout. The knockout came with a left hook to the head by Donaire that sent Arce down flat on his back on the canvas. 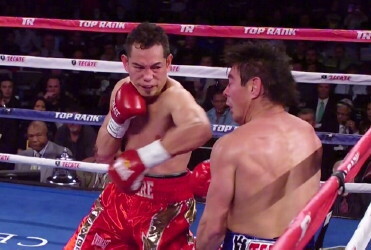 Moments before that, Donaire had hurt Arce with a short right hand to the head and then put him down with a right hand. After the fight, Arce said he’s retiring from boxing. Donaire mentioned wanting to face WBC super bantamweight champion Abner Mares next, but he also said he wouldn’t mind facing WBA champion Guillermo Rigondeaux if he can’t get Mares. « When will Deontay Wilder step up?